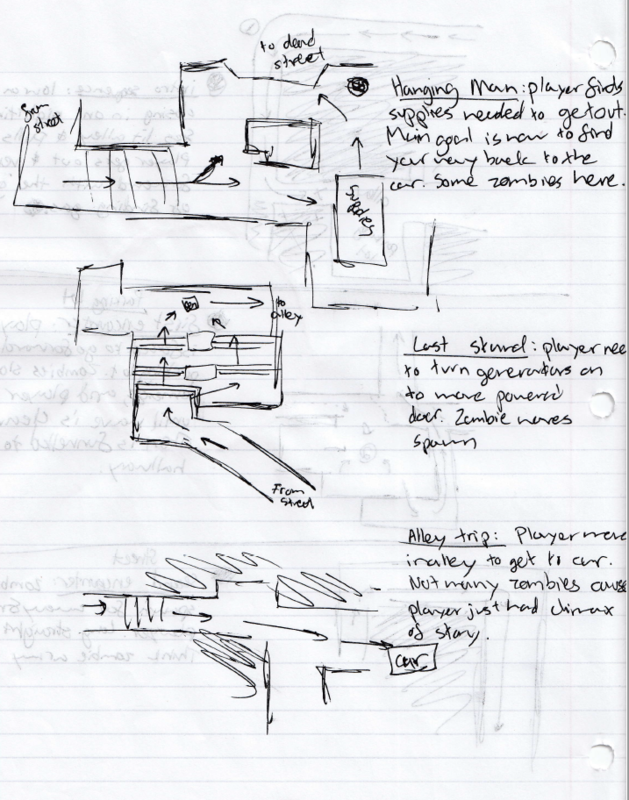 A feature rich level with cinematics, new types of enemies, scripted events, and atmosphere. 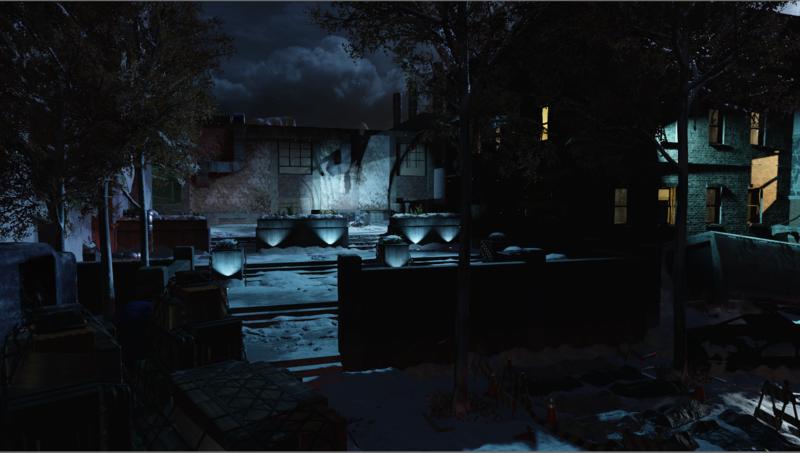 The initial design of this level is to play more like a single player experience inside of the zombies mode in Black Ops III. The design came to me after playing The Division. 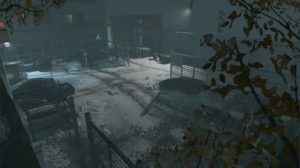 Taking inspiration from the Kips Bay area of the game near the safe house, I wanted to do my best to recreate the feeling I first got when an intense blizzard hit. This level has the side alley near the safe house along with the long streets that connect the areas to each other. Please see below for design flow, design documentation as well as my thought process behind the level and its elements. 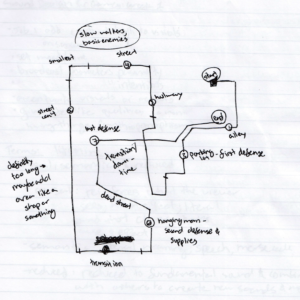 Design flow document detailing which events happen in specific areas and what kind of events they are. Detailed information for the first three events of the level. Shows what the story is behind each event and what will happen. Detailed information for the last three events of the level. Shows what event and what will happen and how the level will progress. Most of the time, companies and even regular mappers start with a block-out. This is just basic geometric shapes that lays out the overall layout of the map. There are multiple reasons this is used, especially in multiplayer maps. By having basic shapes that are in place of props and terrain, iterating on game flow, lines of sight, balance and mechanics is super easy and quick. 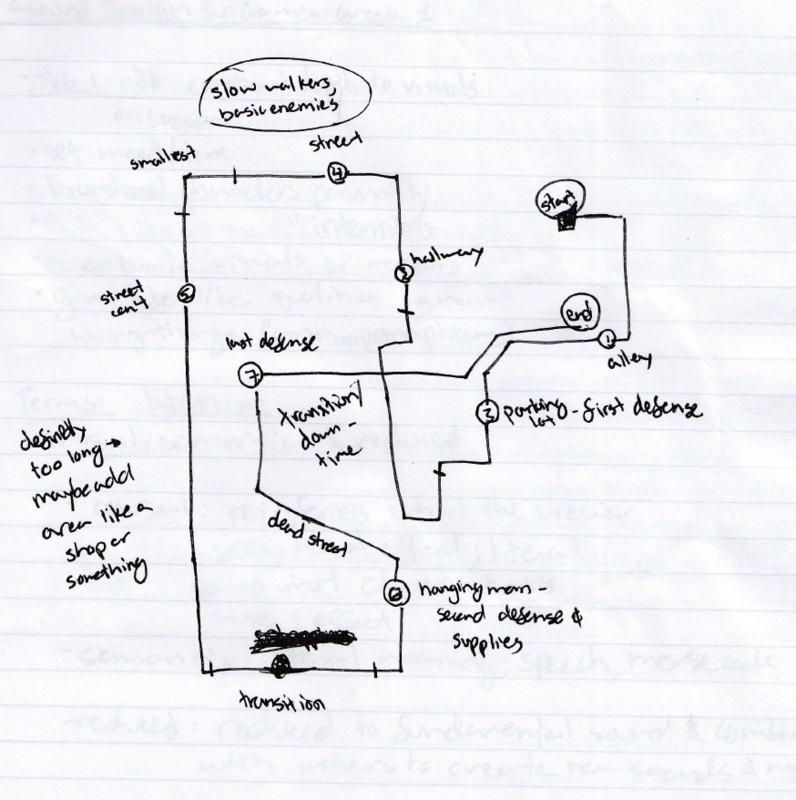 While most places do this, I tend to start my maps a bit differently. Instead of doing a block-out (which hasn’t gone my way in the past), I start out building a small section of the level to establish mood, color, and architecture. Think of it as an art test for a milestone that most companies do for a new game or IP. I knew that this map was going to be based off of New York architecture, be at night or early morning and have dense-ish fog and snow. With this in mind, I built a small building with an alley and parking lot, something you’d see in the city. By doing this, I get a sense of what the rest of the map will be based off of, something I have struggled with (I can quickly block something out, but lose interest or motivation as I begin to detail and work on the map as a whole). This way, I create something I’m proud of that looks good so I have some motivation and inspiration to continue working on it. 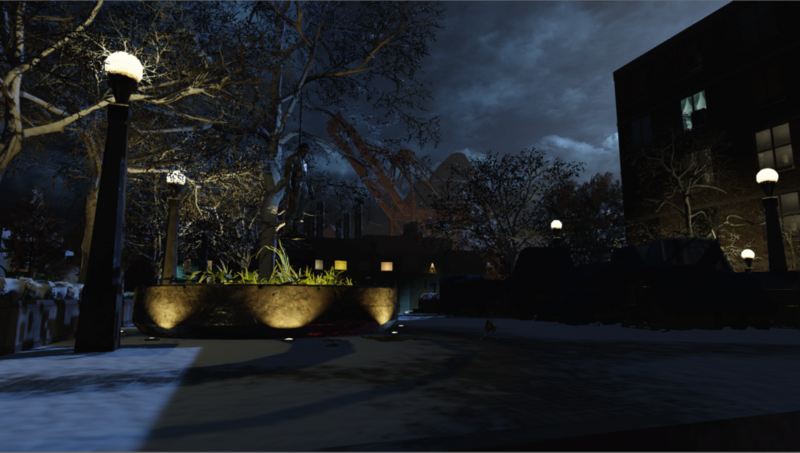 After blocking out 90% of the level, I figured it was a good time to start working on the vista of the level to immerse the player in the world that I am creating. 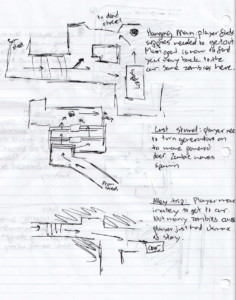 I did not really know what the theme or the location of the level would be until I started writing down the design flow. Since I want this to be more of a single player type experience, I decided to start off the level with a cinematic opening: a car ride into the area showcasing the entire level before you get to start playing. Any car ride has to include a road and since this is based off of New York, I thought to include some elevated highways. Having this elevation allows me to show the entire level during the opening cinematic as the player is driven to the starting location. This shows them what to expect when playing the level. 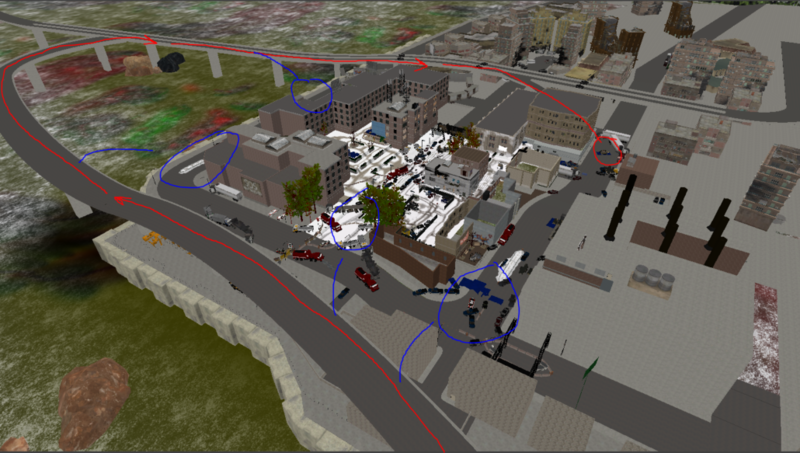 See to the left for details (red is the car’s path, blue shows the area they can see from the road). Something that I learned from a previous art test for an internship at a AAA company was making sure the player is not confused on what to do or where to go. It is such a simple concept but can be easily overlooked. One of the questions I got was along the lines of “you have a lot winding paths at the beginning, how will you make sure they player is not disoriented or lost when playing?” At the time I was less experienced in level design in general and learned about focal points to help alleviate this problem. Obviously, re-designing some of those paths to be less winding can help, but also including some sort of main focal point or reference can also help. 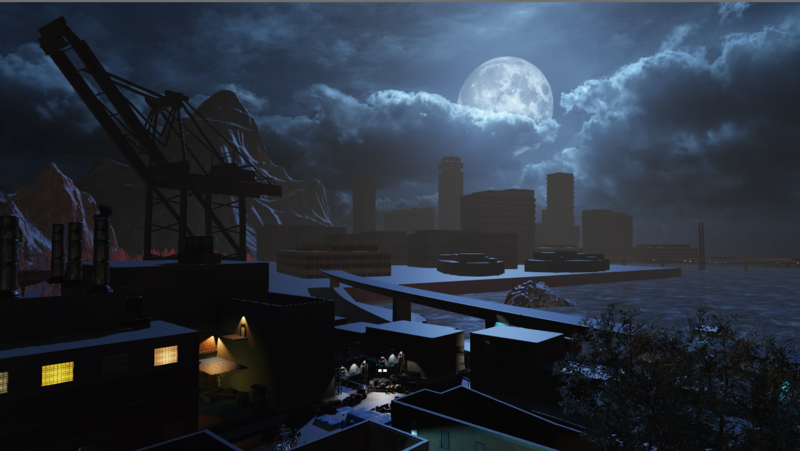 So by taking this learning experience into account, I decided to include this by having the skybox include the moon as well as having a large crane in the vista. For example, the crane is near the factory which is by the starting area, so if they player gets lost they can simply look up and see their relative location to the crane and realize that they are far away from the start area. Distinct locations also help the player with not getting lost, especially in multiplayer or co-op type levels. 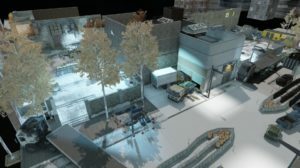 Many multiplayer levels for Call of Duty, for example, have specific “callouts” to let teammates know where you are as well as to let yourself know. Some can be “Restaurant,” “West Alley,” or “Main Street.” I want to incorporate this into my level as well as I have a few main spots that can be called out. I have not thought of all of them yet, but so far there is the “Starting Street”, “Factory”, “Plaza”, and some other misc evacuation zones. All of my previous levels never had stories. They had settings and locations that helped me come up with color pallets and maybe the time of day, but never anything that helped make the space look like it was lived in or had any sort of meaning as to why stuff was where it was. This time around, I want to change that. 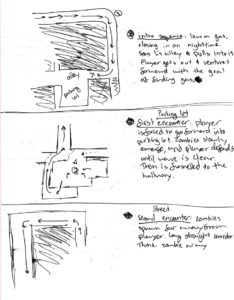 Many zombies levels from Call of Duty have lore or a story behind it as to why the four players are there and why certain elements can exist in that world. 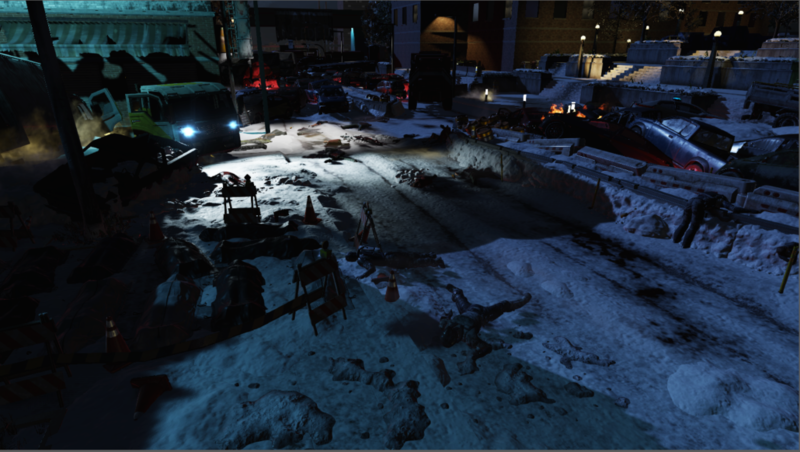 Since my main inspiration for this level is from The Division, I thought to incorporate their Joint Task Force group of people into this level. 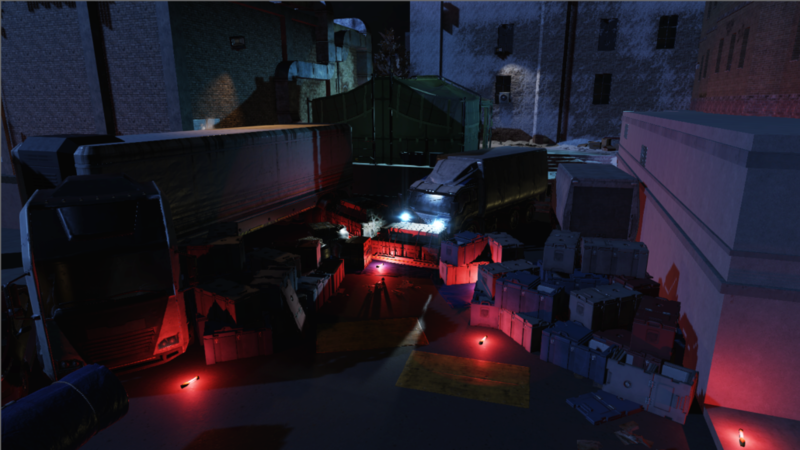 The main goal of the JTF is to help clear out areas of enemies and help others, so what better way to include them than have them go investigate one of their “safe zones” after they get many distress calls from there. When they get there, there are remnants of evacuation zones when the outbreak first hit the city. 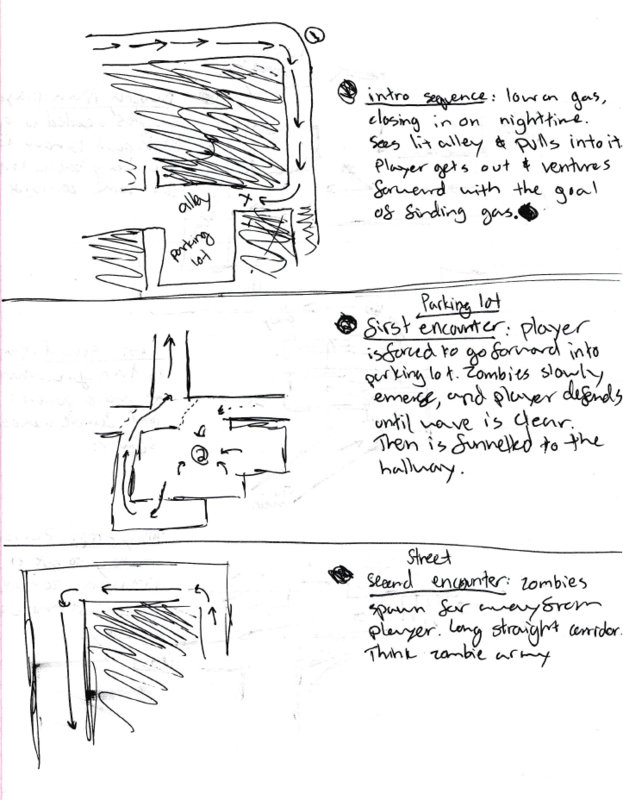 There are locations where cars have crashed into each other in panic during the outbreak. 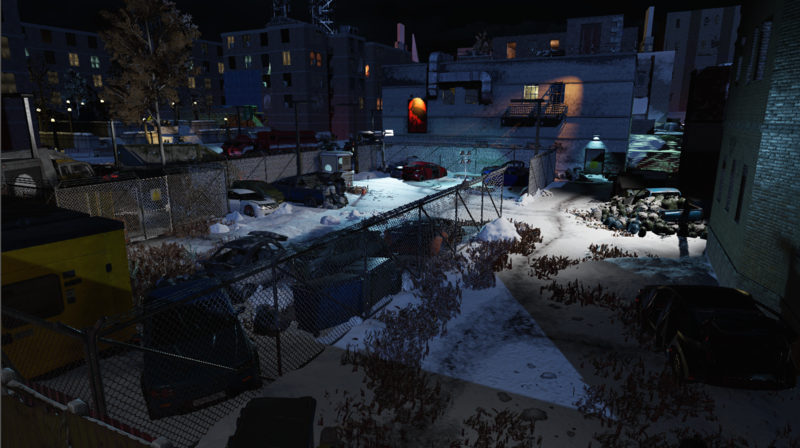 Snow has piled up on top of things to show that time has passed since the outbreak hit. There are “safe zones” that have indoor cover that the first responders may have brought and set up to help the citizens. Bodies and body bags are everywhere as some people may have attempted to clean up after they secured the peninsula to make it more manageable to live in. 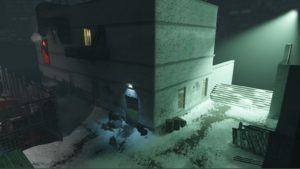 Lighting can make or break a level. The same goes for texturing, but I feel that my texturing is much better than lighting so instead I will discuss my reasoning and plans on how to make my lighting skills better. Many players do not know that lighting is purposefully placed in a way to guide them to areas or show them points of interest (like, let me shine this light on this box because you need to pick it up). Sometimes areas are not lit because they are a dead end and there is nothing to gain from going there. This is all taken into account for this level to make it easier for them to traverse the level. Many main points of interest have spotlights that shine to an alley or a car that say, “Hey! 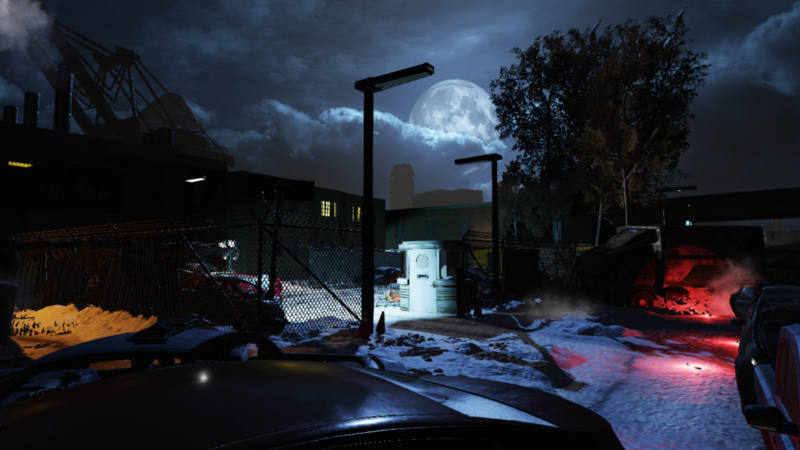 I’m a cool colored light that is inviting, come explore that area that I’m shining at.” Because the skybox is a dark, blue color I wanted to make sure that I do not have too many dark and blue lights in my map. I’ve never been impressed or inspired by same colored outfits, so why should I do the same with lights? Instead, I am playing around with complimentary, analogous and monochromatic color schemes. For example, having bright and/or dark red flares in the street make the path stand out when compared to the dark snow and sun color.